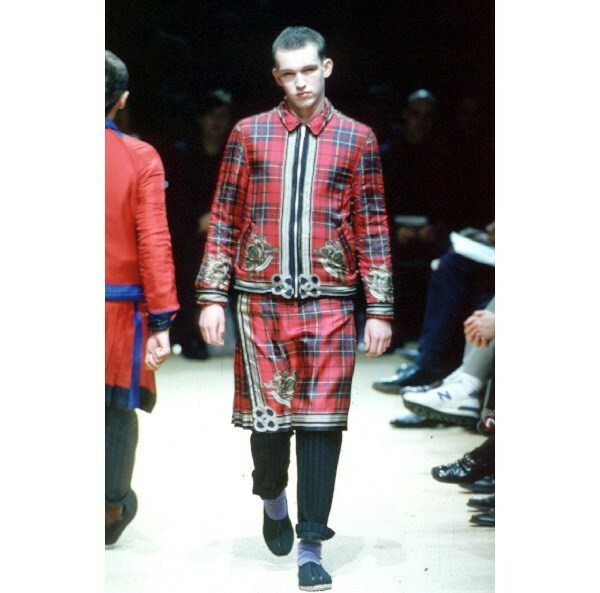 When Rei Kawakubo opened her first Comme des Garçons boutique in Tokyo in 1973, the revolutionary retail space – where collections were stored unseen in a backroom – did not contain a single mirror. "You just had to feel confident and had to learn about the way the clothes felt on you," explains Octavius la Rosa, the founder of the Melbourne-based vintage boutique dot COMME, which specialises in museum-worthy archival pieces by Comme des Garçons, Junya Watanabe, Issey Miyake, Yohji Yamamoto, Bernhard Willhelm and Walter Van Beirendonck. "It was so radical." Now, after a decade of sourcing rare Comme des Garçons designs – from silhouette distorting pieces from the seminal womens S/S97 Lumps and Bumps collection, to mens pixelated camo and plaid dip-dyed suits – la Rosa has transported 350 pieces from his store above a Subway sandwich shop in Australia, to Paris, where Comme des Garçons has shown its runway show since 1981. "There is only one mirror, and a red light which pays homage to the Comme des Garçons store at the rue Saint-Honoré," explains Theodoros Genitsakis, who art directed the space. 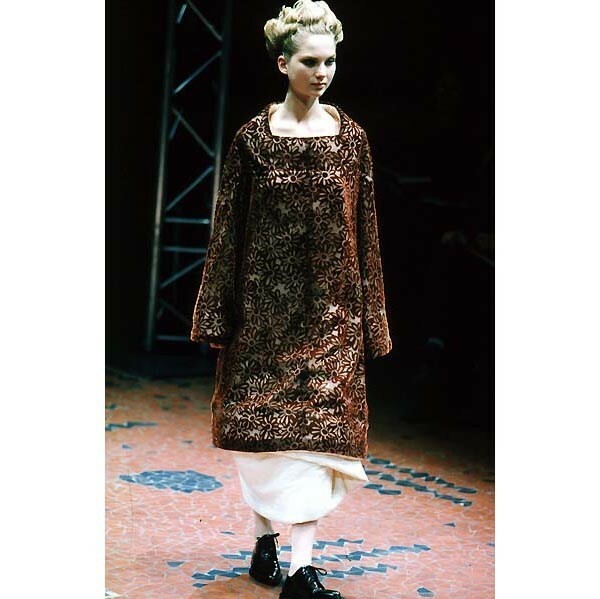 "From what is, in my opinion, the most iconic Comme des Garçons collection (though it was a commercial failure); I love this collection because it pushed the boundaries of what were considered acceptable silhouettes, and were perhaps even a pre-cursor to Rei’s more current collections which consider clothing as sculpture for the body." 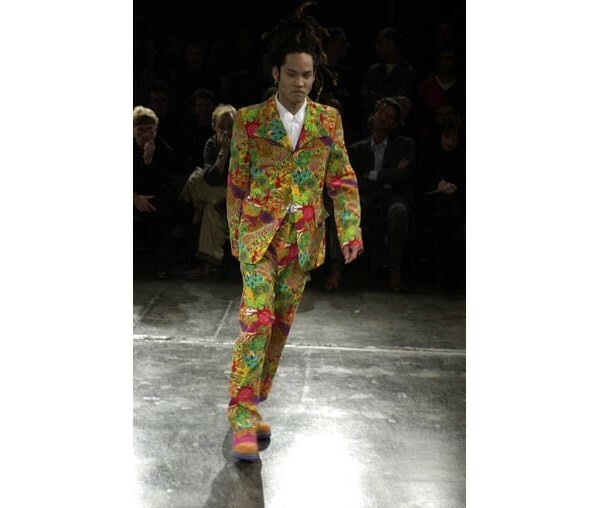 "I bought this suit from another collector; it’s part of a collection considered by a lot of Comme des Garçons fans to be one of the true masterpieces of menswear. It included the sort of fabrics you'd expect to see in 18th-century aristocratic costume cut up and patched in peasantry style, and every piece is individually patched and different to the next." "My favourite collection; I love the cuts, the fabrics, the styling – everything is perfect! This piece feels like something from a twisted fairytale. I found the blanket dress locally and the upper is from Italy." "Inspired by the psychedelic period, I love all the fabrics from this collection; there are lots of amazing colours and patterns! I bought the pants in Tokyo and later found the matching jacket in Italy." "This collection showed lingerie as outerwear; totally weird, but I love the combination of colours, the general level of distastefulness, and the use of fabrics considered cheap attached to those considered luxurious. The pants I found locally, and the jacket I found in Osaka. The styling was very much what you might see in a fashion show today – so relevant!" "I got this jacket from a customer in London. It has a silk scarf print with a gilt border and a thick knitted lining; other jackets from this collection were lined with a silk scarf fabric. This was also the first collection to introduce the super low drop crotch into menswear, which is now a staple of Comme des Garçons." 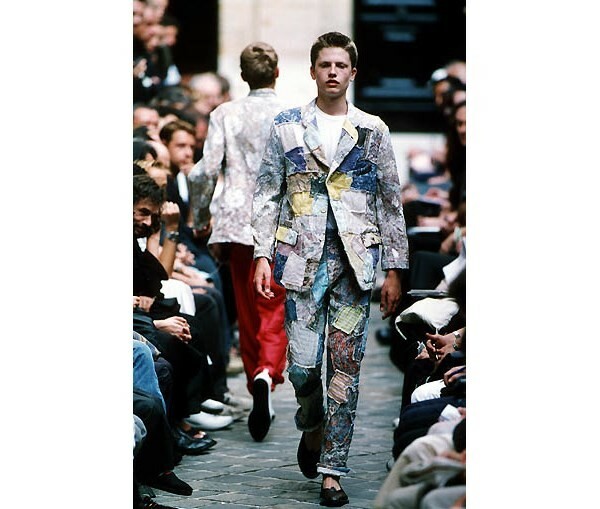 1991-2001 The Odyssey of Comme des Garçons runs at 10 Rue de la Paix until October 6, 2016.